The Velbon QHD-61Q is one of two top-end ball and socket heads from Velbon, the other being the larger QHD-71Q. Like that model, it separates itself from its cheaper siblings with its magnesium-alloy construction. But at just 310g it doesn't add much to the weight of the tripod on which it's mounted. The head can support a maximum weight of 4kg, which is sufficient for most pro DSLR and lens combinations. At its base there's a standard 1/4-inch tripod thread, while two spirit levels on the back and side of the main platform enable you to see how level the camera is, although the vial on the side is easily obscured once a camera is mounted. The ball is released via a lock to one side, and once locked into position it stays fixed, with no play whatsoever. The Quick Release platform is wider than usual, making it ideal for larger-bodied DSLRs, and is easily released from the head via a lever. A small detachable key on the plate's underside enables the screw to be loosened and the plate detached from the camera, which is far preferable to fumbling around in your pocket for a small coin. 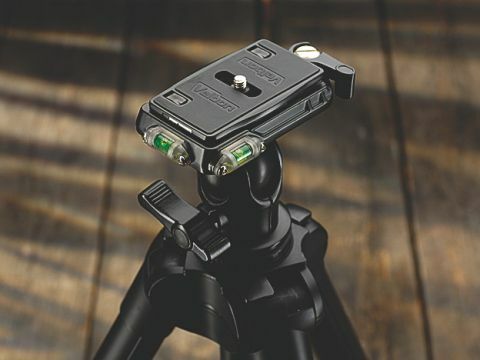 Although its finish doesn't quite match that of the Rexi L tripod, the two partner well, and can be found as a kit for around £170. This makes it compare well with similar options from the likes of Giottos and Vanguard. Overall, the Velbon QHD-61Q is a lightweight yet solid option for Velbon users, and is arguably better value than the more senior QHD-71Q option.